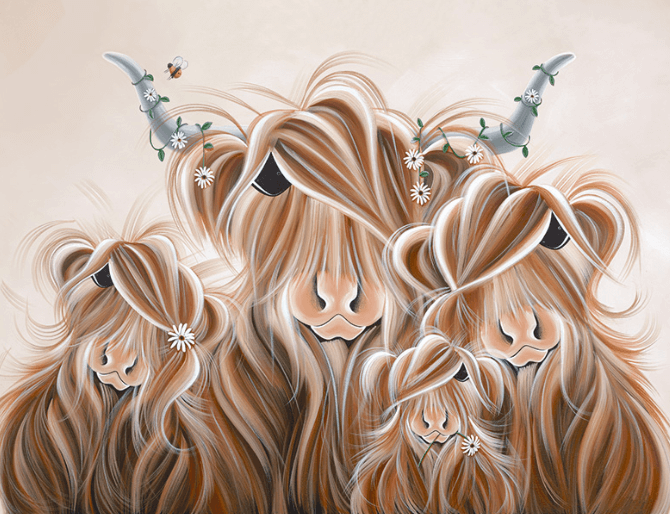 Jennifer Hogwood's bold, distinctive style arises from an unerring sense of colour, a singular talent for observation, and a huge affection for her highland friends 'The McMoos'. Her endearing images communicate the essence of her subject with humour and charm. Just down the road from her house Jennifer's studio is a former milking parlour on a working farm in rural Wiltshire. The setting is perfect with beautiful views and a field full of cows just outside the door. It's always peaceful and this sense of calm makes it the ideal place for her to work. Seeing the cows grazing in the fields, chickens wandering around the yard and dogs ambling in and out is a constant source of inspiration. Animals have always been a big part of Jennifer's life and she finds their presence comforting - "they have such individual personalities and a lovely innocence about them." Before starting to paint, Jennifer spends time with a pencil sketching freehand, adding more and more detail until she feels the composition is perfect. She then begins to apply the paint in layers, drying it as quickly as possible in order to build up a richness of colour and texture, then adding other elements to bring character to each piece. The collectable editions reflect this, being beautifully hand embellished, with little jewels to add a sparkle to their eyes. She has created her own unique shade of brown which she uses in every painting; knowing exactly how it will react if she adds a touch of white or dark makes the painting process flow with ease. She begins each painting with the nose and works outwards, adding in the layers of detail until the final stages of white highlighting. Born in 1980, Jennifer grew up in a rural village in Bedfordshire. Surrounded by rolling fields she spent as much time as possible outdoors often riding. Although she always loved painting and being creative she had no formal art training and is completely self taught. "I take something away from every piece I create and as an artist I am constantly evolving."